Laser-driven x-ray sources are an emerging alternative to conventional x-ray tubes and synchrotron sources. We present results on microtomographic x-ray imaging of a cancellous human bone sample using synchrotron-like betatron radiation. The source is driven by a 100-TW-class titanium–sapphire laser system and delivers over 108 X-ray photons per second. Compared to earlier studies, the acquisition time for an entire tomographic dataset has been reduced by more than an order of magnitude. Additionally, the reconstruction quality benefits from the use of statistical iterative reconstruction techniques. Depending on the desired resolution, tomographies are thereby acquired within minutes, which is an important milestone toward real-life applications of laser–plasma x-ray sources. W. D. Coolidge and E. E. Charlton, “Roentgen-ray tubes,” Radiology 45, 449–466 (1945). B. W. J. McNeil and N. R. Thompson, “X-ray free-electron lasers,” Nat. Photonics 4, 814–821 (2010). A. Rousse, P. Audebert, J. P. Geindre, F. Fallies, J. C. Gauthier, A. Mysyrowicz, G. Grillon, and A. Antonetti, “Efficient K-alpha-x-ray source from femtosecond laser-produced plasmas,” Phys. Rev. E 50, 2200–2207 (1994). A. Döpp, E. Guillaume, C. Thaury, A. Lifschitz, F. Sylla, J. P. Goddet, A. Tafzi, G. Iaquanello, T. Lefrou, P. Rousseau, E. Conejero, C. Ruiz, K. T. Phuoc, and V. Malka, “A bremsstrahlung gamma-ray source based on stable ionization injection of electrons into a laser wakefield accelerator,” Nucl. Instrum. Methods Phys. Res. A 830, 515–519 (2016). T. Popmintchev, M. C. Chen, D. Popmintchev, P. Arpin, S. Brown, S. Alisauskas, G. Andriukaitis, T. Balciunas, O. D. Mucke, A. Pugzlys, A. Baltuska, B. Shim, S. E. Schrauth, A. Gaeta, C. Hernandez-Garcia, L. Plaja, A. Becker, A. Jaron-Becker, M. M. Murnane, and H. C. Kapteyn, “Bright coherent ultrahigh harmonics in the keV x-ray regime from mid-infrared femtosecond lasers,” Science 336, 1287–1291 (2012). S. Corde, K. Ta Phuoc, G. Lambert, R. Fitour, V. Malka, A. Rousse, A. Beck, and E. Lefebvre, “Femtosecond x-rays from laser-plasma accelerators,” Rev. Mod. Phys. 85, 1–48 (2013). E. Esarey, C. B. Schroeder, and W. P. Leemans, “Physics of laser-driven plasma-based electron accelerators,” Rev. Mod. Phys. 81, 1229–1285 (2009). A. Rousse, K. T. Phuoc, R. Shah, A. Pukhov, E. Lefebvre, V. Malka, S. Kiselev, F. Burgy, J. P. Rousseau, D. Umstadter, and D. Hulin, “Production of a keV x-ray beam from synchrotron radiation in relativistic laser-plasma interaction,” Phys. Rev. Lett. 93, 135005 (2004). K. Khrennikov, J. Wenz, A. Buck, J. Xu, M. Heigoldt, L. Veisz, and S. Karsch, “Tunable all-optical quasimonochromatic Thomson x-ray source in the nonlinear regime,” Phys. Rev. Lett. 114, 195003 (2015). A. Krol, A. Ikhlef, J. C. Kieffer, D. A. Bassano, C. C. Chamberlain, Z. Jiang, H. Pépin, and S. C. Prasad, “Laser-based microfocused x-ray source for mammography: feasibility study,” Med. Phys. 24, 725–732 (1997). R. Toth, J. C. Kieffer, S. Fourmaux, T. Ozaki, and A. Krol, “In-line phase-contrast imaging with a laser-based hard x-ray source,” Rev. Sci. Instrum. 76, 083701 (2005). S. Fourmaux, S. Corde, K. T. Phuoc, P. Lassonde, G. Lebrun, S. Payeur, F. Martin, S. Sebban, V. Malka, A. Rousse, and J. C. Kieffer, “Single shot phase contrast imaging using laser-produced Betatron x-ray beams,” Opt. Lett. 36, 2426–2428 (2011). A. Döpp, E. Guillaume, C. Thaury, J. Gautier, I. Andriyash, A. Lifschitz, V. Malka, A. Rousse, and K. T. Phuoc, “An all-optical Compton source for single-exposure x-ray imaging,” Plasma Phys. Controlled Fusion 58, 1–5 (2016). J. Wenz, S. Schleede, K. Khrennikov, M. Bech, P. Thibault, M. Heigoldt, F. Pfeiffer, and S. Karsch, “Quantitative x-ray phase-contrast microtomography from a compact laser-driven betatron source,” Nat. Commun. 6, 7568 (2015). J. M. Cole, J. C. Wood, N. C. Lopes, K. Poder, R. L. Abel, S. Alatabi, J. S. J. Bryant, A. Jin, S. Kneip, K. Mecseki, D. R. Symes, S. P. D. Mangles, and Z. Najmudin, “Laser-wakefield accelerators as hard x-ray sources for 3D medical imaging of human bone,” Sci. Rep. 5, 13244 (2015). S. Kneip, C. McGuffey, F. Dollar, M. S. Bloom, V. Chvykov, G. Kalintchenko, K. Krushelnick, A. Maksimchuk, S. P. D. Mangles, T. Matsuoka, Z. Najmudin, C. A. J. Palmer, J. Schreiber, W. Schumaker, A. G. R. Thomas, and V. Yanovsky, “X-ray phase contrast imaging of biological specimens with femtosecond pulses of betatron radiation from a compact laser plasma wakefield accelerator,” Appl. Phys. Lett. 99, 093701 (2011). D. Paganin, S. C. Mayo, T. E. Gureyev, P. R. Miller, and S. W. Wilkins, “Simultaneous phase and amplitude extraction from a single defocused image of a homogeneous object,” J. Microsc. 206, 33–40 (2002). A. Buck, K. Zeil, A. Popp, K. Schmid, A. Jochmann, S. D. Kraft, B. Hidding, T. Kudyakov, C. Sears, and L. Veisz, “Absolute charge calibration of scintillating screens for relativistic electron detection,” Rev. Sci. Instrum. 81, 033301 (2010). E. Y. Sidky, L. Yu, X. Pan, Y. Zou, and M. Vannier, “A robust method of x-ray source spectrum estimation from transmission measurements: demonstrated on computer simulated, scatter-free transmission data,” J. Appl. Phys. 97, 124701 (2005). S. R. Stock, Microcomputed Tomography: Methodology and Applications (CRC, 2008). J. A. Fessler, “Statistical image reconstruction methods for transmission tomography,” Handb. Med. Imag. 2, 1–70 (2000). P. J. Huber and E. M. Ronchetti, Robust Statistics: The Approach Based on Influence Functions (Wiley, 2011), Vol. 114. F. Peyrin, M. Salomé, P. Cloetens, A. M. LAval-Jeantet, E. Ritman, and P. Rüeegsegger, “Micro-CT examinations of trabecular bone samples at different resolutions: 14, 7 and 2 micron level,” Technol. Health Care 6, 391–401 (1998). D. Cooper, A. Turinsky, C. Sensen, and B. Hallgrimsson, “Effect of voxel size on 3D micro-CT analysis of cortical bone porosity,” Calcif. Tissue Int. 80, 211–219 (2007). M. Guizar-Sicairos, J. J. Boon, K. Mader, A. Diaz, A. Menzel, and O. Bunk, “Quantitative interior x-ray nanotomography by a hybrid imaging technique,” Optica 2, 259 (2015). M. Pittman, S. Ferr, J. P. Rousseau, L. Notebaert, J. P. Chambaret, and G. Chériaux, “Design and characterization of a near-diffraction-limited femtosecond 100-TW 10-Hz high-intensity laser system,” Appl. Phys. B 74, 529–535 (2002). A. Döpp, B. Mahieu, A. Lifschitz, C. Thaury, A. Doche, E. Guillaume, G. Grittani, O. Lundh, M. Hansson, J. Gautier, M. Kozlova, J. P. Goddet, P. Rousseau, A. Tafzi, V. Malka, A. Rousse, S. Corde, and K. Ta Phuoc, “Stable femtosecond x-rays with tunable polarization from a laser-driven accelerator,” Light Sci. Appl. 6, 1–21 (2017). I. A. Andriyash, R. Lehe, A. Lifschitz, C. Thaury, J. M. Rax, K. Krushelnick, and V. Malka, “An ultracompact x-ray source based on a laser-plasma undulator,” Nat. Commun. 5, 4736 (2014). J. Ferri, S. Corde, A. Döpp, A. Lifschitz, A. Doche, C. Thaury, K. Ta Phuoc, B. Mahieu, I. A. Andriyash, V. Malka, and X. Davoine, “High-brilliance betatron gamma-ray source powered by laser-accelerated electrons,” arXiv:1711.08687v1 (2017). D. Guénot, D. Gustas, A. Vernier, B. Beaurepaire, F. Böhle, M. Bocoum, M. Lozano, A. Jullien, R. López-Martens, A. Lifschitz, and J. Faure, “Relativistic electron beams driven by kHz single-cycle light pulses,” Nat. Photonics 11, 293–296 (2017). F. Salehi, A. J. Goers, G. A. Hine, L. Feder, D. Kuk, B. Miao, D. Woodbury, K. Y. Kim, and H. M. Milchberg, “MeV electron acceleration at 1 kHz with <10 mJ laser pulses,” Opt. Lett. 42, 215–218 (2017). M. Müller, M. Kienel, A. Klenke, T. Gottschall, E. Shestaev, M. Plötner, J. Limpert, and A. Tünnermann, “1 kW 1 mJ eight-channel ultrafast fiber laser,” Opt. Lett. 41, 3439–3442 (2016). G. Mourou, B. Brocklesby, T. Tajima, and J. Limpert, “The future is fibre accelerators,” Nat. 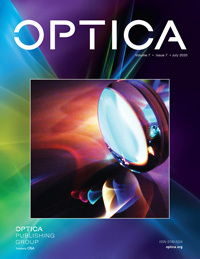 Photonics 7, 258–261 (2013). Fig. 1. Top: Experimental layout (not to scale). The laser pulse is focused using an f/25 off-axis parabola on a hydrogen gas cell of variable length. As a result of the laser–plasma interaction in the cell, electrons and x-rays are generated. The sample is placed between the gas cell and the dipole magnet spectrometer, protected by an aluminum foil. X-rays are detected on the x-ray detector with a geometrical magnification of ∼4–7. Middle: Average electron beam spectrum and beam profile (inset) for 20 consecutive shots. The shaded area indicates the RMS error; dots in the inset show the beam pointing of individual shots. Bottom: Average x-ray spectrum at the detector as reconstructed from filter transmissions over 20 consecutive shots. The shaded area indicates the RMS error; the inset shows the average image of the filter transmissions. Fig. 2. Tomography of cancellous bone sample. Bottom left: Photograph of the sample. Top left: Macro photography as in the experimental setup. Center: Radiograph using the scintillator camera. Right: Rendering of the tomographic reconstruction with statistical image reconstruction (SIR), showing transverse and longitudinal cross sections. Fig. 3. Projection slices for the tomographic reconstruction with SIR. Insets show the position of the slices relative to the raw data. Fig. 4. Quick tomography: Comparison between reconstruction with filtered back-projection (top) and statistical iterative reconstruction (bottom).